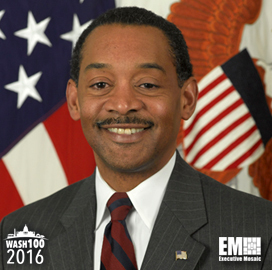 Executive Mosaic is honored to introduce Jonathan Woodson, assistant defense secretary for health affairs, for the second consecutive year, as an inductee into the 2016 edition of the Wash100 — Executive Mosaic’s annual selection of influential leaders in the government contracting arena. In this capacity, Woodson serves as a principal adviser to the defense secretary on health issues and manages a $50 billion budget for the Military Health System. He helps oversee several health organizations under the Defense Department such as the Defense Health Agency and the Uniformed Services University of the Health Sciences. DoD awarded its much-anticipated Defense Healthcare Management System Modernization program in July to a team led by Leidos, which will implement a new electronic health record system for military hospitals and other healthcare facilities. “Even apart from the wartime requirements, the patients we serve are frequently on the move, as are our caregivers, so it is very important to have a highly integrated system that is portable to serve the needs wherever they may be required,” Woodson said of DHMSM at the time. In October 2015, DHA achieved full operational capability as a combat support agency. “Readiness is key, and that’s what this agency is about,” Woodson said. He also added that DHA works to standardize the military health system through the implementation of common business and clinical practices across military hospitals. In June 2015, Woodson said at a hearing of the House Armed Services Committee’s military personnel subpanel that MHS has introduced changes to governance and agrees with the Military Compensation and Retirement Modernization Commission’s recommendations. “We’ve undertaken a comprehensive review of our medical infrastructure and resources and [we’ve] presented a modernization plan that proposes to place our most-skilled professionals in the military communities where they are likely to keep those skills sharpest,” he said. Woodson is also a principal adviser to the personnel and readiness undersecretary at DoD with regard to chemical, radiological, nuclear and biological defense programs as well as the health of deployed forces. He serves as a co-chairman of the Armed Services Biomedical Research Evaluation and Management Committee. Executive Mosaic congratulates Jonathan Woodson and the DoD team for their selection to receive this award.